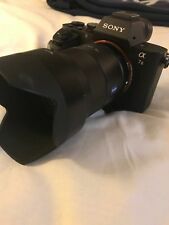 Sony SEL2870 FE 28-70mm F3.5-5.6 OSS Lens. Autofocus : Yes. The sony FE 28-70. f/3.5-5.6 OSS Lens is a versatile, compact. Filter Thread Front : 55mm. Include a Sony Hood (alc-sh132). This is a separate product from new Sony A7 II kit. The Sony SEL 28-70mm full-frame camera lens for Sony E-mount cameras provides a flexible range for capturing images with its capability of zooming from 28mm to 70mm. The seven-blade, circular aperture pushes beyond the standard for an improved defocusing experience. The premium blades used inside also allow for enhancements to the bokeh effect. The aspherical lens and extra-low dispersion glass are a powerful combination meant to reduce distortion and create images with brilliant contrast, resolution, and color fidelity. Image stabilization reduces the risk associated with out of focus and blurry results. The usage of quiet linear motors helps to achieve this. With the dust and moisture-resistant design, feel the freedom of securing photographs of wildlife and landscapes. Anyone who's interested in landscape photography finds that this lens works particularly well. Photographers find it easy to carry this lightweight lens on photo expeditions. This specific 28-70mm zoom lens is compatible with all Sony E mountings. Any Sony cameras, such as the A7R, that are compatible with these mountings are able to accommodate these OSS lenses. The 28-70mm zoom allows for full frame capture, ensuring that you get a wide view of your images. The full frame capability of the Sony Zeiss 28-70mm lenses is set to a maximum format size of 35mm, to replicate standard 35mm film. This 28-70mm Zeiss lens comes in stylish black coloring that ensures it fits well with any camera you use it with. At just over 10 ounces, carrying it with you is a breeze. This light weight ensures that your arms don't get tired in lengthier shoots. As for the aperture range of this specific zoom lens, it ranges from f3.5-5 at maximum. The minimum is set to f/22. In regard to the ED glass mentioned previously, this glass was specifically made to accommodate longer focal lengths. The result of this glass is pristine image quality and a reduction in chromatic aberration. This is the case even at large settings. The aspherical lens elements of these Sony 28-70mm items ensure that light rays pass accurately through the lens for a clear picture that's not affected by artificial elements. This also assists greatly with keeping image quality high and reducing its size and weight. While this specific item was designed primarily to be used alongside photography, it also works well for anyone that shoots video. The inherent sharpness of the images caught by this item, as well as its high performance, ensure that your videos are captured well. In order to focus on an object with this type of lens, the middle groups within the optical system are the only ones to move. This keeps the length of the OSS the same no matter how much you zoom in. Additional benefits to be found with this product include extremely quick auto focusing and a filter thread that doesn't move. This is especially beneficial if you use a polarizing filter. item 1 Sony FE 28-70mm f/3.5-5.6 OSS Lens (Black)!! PRO BUNDLE BRAND NEW!! -Sony FE 28-70mm f/3.5-5.6 OSS Lens (Black)!! PRO BUNDLE BRAND NEW!! Used as a kit lens the 28-70 f/3.5-5.6 FE from Sony is a bargain lens. Nice focal range for full frame or APS-C sized sensor cameras. DxOMark rates this lens on par with lenses more than double the price. Sharp in the center with minimum chromatic abberation and distortion. It's not as spectacular as a low light prime but it is a perfect inexpensive all around lens which will spend a lot of time on your camera if you are traveling, at a family affair or just going out for some street photography. the range is not wide enough should be 24-70 and the speed of the lens isn't great either. no manual focus option, this part is the biggest problem, no select focus option, i try to get a focus than move the camera, while keeping the shutter button half pressed down, but it doesn't hold the focus point. just a cheap compromise I have a Canon f2,8 16-35 and a Canon f2,8 24-70, when i need super quality, but very heavy since it has real glass not plastic like the Sony. How can a product be any better than brand new? Everything works as described, crisp tack sharp photos every time! Will recommend to friends and family!